AMD officially announced its Radeon Instinct Vega 7nm graphics card during its Computex live stream in the early hours of this morning. This will be the first 7nm GPU from the company, and primarily a machine learning card, but AMD CEO Lisa Su also promised gamers a slice of the 7nm pie. Sadly, AMD’s CEO Lisa Su already crushed any glimmer of hope for a 7nm Vega card intended for gamers this year. The latest news straight from AMD confirms that, while multiple 7nm products are in various stages of validation and assembly, only server-side Radeon Instinct and EPYC servers will be getting the 7nm treatment this year. Can’t wait until 7nm in 2019? Don’t worry, here are the best graphics cards of 2018. The Radeon Instinct Vega 7nm card is intended for machine learning and AI applications, and is intended to be a very powerful tool for compute tasks. Equipped with a massive 32GB bank of HBM2 memory and dedicated inference-enhancing operations, the card is designed to massively accelerate machine learning inference and work with massive datasets. AMD showed off the 7nm Vega graphics card within a Cinema4D, and also touched on developments of AMD’s very own ray tracing libraries and rendering tech. 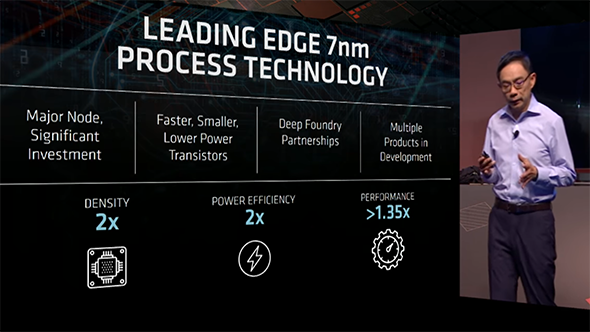 AMD is touting the 7nm process as offering double the power efficiency, and more than 35% greater performance from the last 14nm transistor process node – although these are the blanket figures from TSMC and GlobalFoundries regarding the two companies entire 7nm portfolios. Whether AMD can unlock all that potential is yet to be seen, but gamers should expect to see some of the benefits from the move to 7nm once AMD launch the first 7nm Navi graphics cards and 7nm Zen 2 CPUs sometime next year. 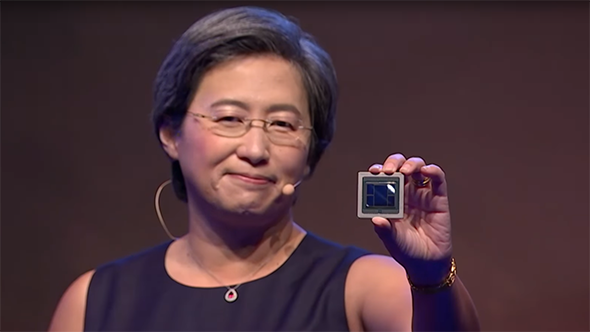 “We made a bet on 7nm,” Lisa Su says at the AMD Computex event. “We made a bet that we needed great architecture and great process technology. So now we have been able to show you the world’s first 7nm GPU. Vega is noticeably missing from Su’s promise to gamers, which is another small hint that Vega 7nm will be compute-focused for its entire lifespan. That likely puts Navi front and centre for gamers with the next AMD Radeon RX generation. AMD seems exceptionally confident in the 7nm process and initial 7nm GPU products – almost certainly manufactured by TSMC in this case – which makes quite a stark contrast to the bumpy road that Intel have been on for some time with 10nm. AMD is already sampling the Radeon Instinct 7nm Vega card, and expects it to release before the end of 2018 – alongside the first Zen 2 7nm EPYC products. As for 7nm Radeon RX gaming GPUs, it’s looking hopeful that AMD is still on track for a 2019 launch. For the meantime, however, the RX Vega 56 Nano will have to do.